The densely padded seat has a cut-out that can be positioned to the front, back, or either side and the foam is configured in our unique "Waterfall" style that addresses pressure problems caused from sensitive tissue coming in contact with unforgiving surfaces. The open frame system not only affords unimpeded directional seat placement but also allows the optional back and arms to be correctly positioned without restriction and without tools. The 350-pound capacity frame is created from high-quality Stainless Steel that provides a strong, durable, non-corrosive product. The name hints at what this product is intended to do. That is give maximum aid in one versatile product. 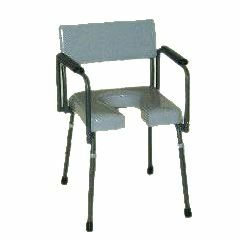 It can be an adjustable height toilet seat, a toilet safety frame, a shower bench or a transfer bench. The modular design lets you decide. Adjustable legs vary seat height: 19.5" - 22.5"
are side arms removable? can it ship without sides?